HCPAC is thrilled to announce our new season! With a continued vision of bringing quality performances with a Christ centered perspective, the 2018-2019 lineup promises to display the young talent in many creative ways! 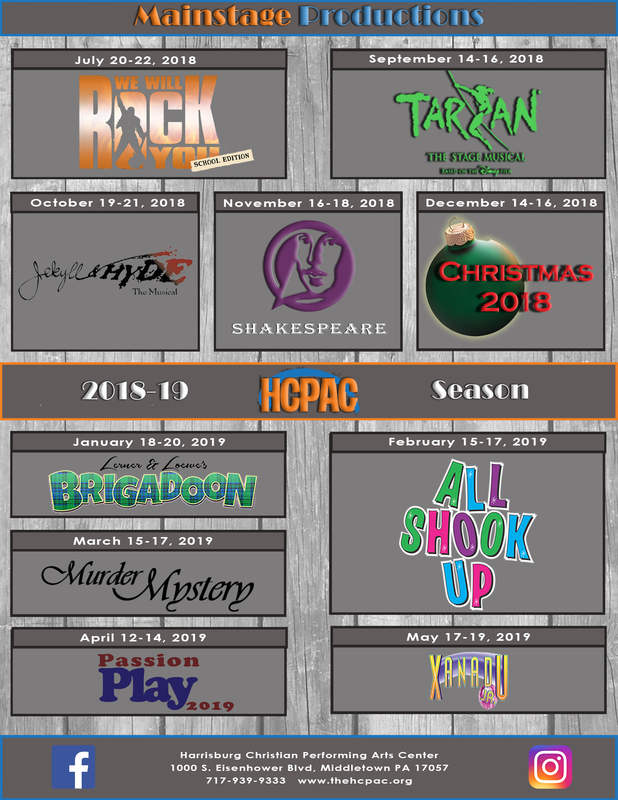 With six Victory Player productions (7th Grade to Adult), two Possibility Player productions (3rd to 9th Grade) and two Eternity Player productions (All Ages), you’ll find so many reasons to be at HCPAC every month. Check out the line-up to the left and get full show information here. To help you get back every month, HCPAC will be offering Full Season Tickets for all ten productions ($120), and 1/2 Season Tickets ($60). That is a 20% discount off the individual ticket price. 2018-2019 season tickets will be available for purchase starting March 1, 2018. Individual show tickets will be available starting March 15. Be sure to join us for the remainder of our 2017-18 season! Tickets for 12th Night and Behold the Lamb are now available. The Fantasticks and Madagascar JR will be available this week! They can be purchased here or at the door for $3 more.